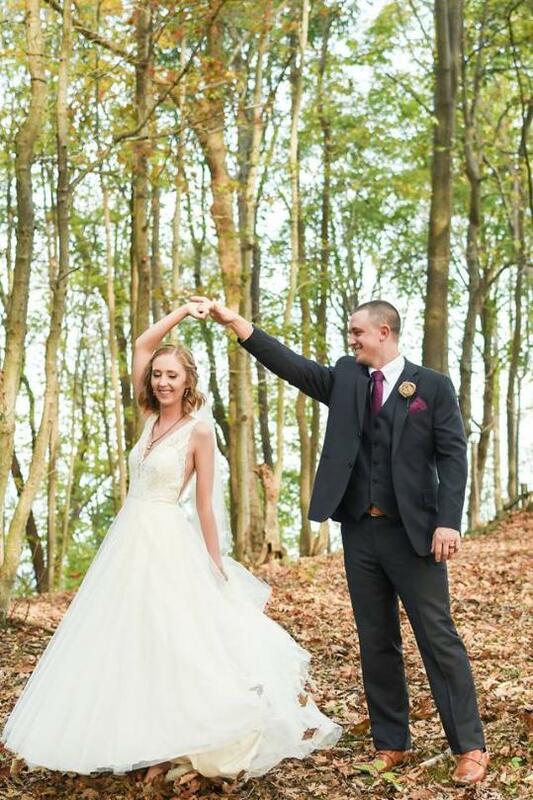 Our vision and goal at Lovewell Lodge and Weddings is to provide a unique, relaxed atmosphere where you will make memories to last a life time. The Pavilion is made from rough cut lumber, with beautiful lighting, vintage mirrors and wall hangings. There are multiple electrical outlets inside, ceiling fans and on those chilly nights we have two large patio heaters and a fire pit. In case of rain, our Pavilion can work beautifully for both ceremony and reception. The Lodge is a charming cabin with an open floor plan upstairs that can be used for the brides needs the day of the wedding and as a honeymoon suit for the bride and groom on their wedding night. The property for your rehearsal from Friday at 4:00 p.m.- 8:00 p.m. and Saturday from 9:00 a.m.- 11:00 p.m. for set up and clean up. The cabin on Saturday for the brides needs, the ceremony and our Rustic pavilion for reception. add on our cabin for overnight stay both Friday and Saturday night for $500 extra. To reserve your date please complete and sign our contract with 1/2 of the wedding package price of $1500. Final payment of $1500 is due 30 days prior to your event. Package with cabin your final payment would be $2,000. At no extra cost, we will have the tables and chairs set up for your event on Friday. We can help with parking and be there to direct your wedding to help your day go as smooth as possible. You may use any vendors such as caterer's, photographers, florist etc. that best suits your needs and budget. Please feel free to contact us at anytime to set up a visit with us!